Additionally, CCH Pounder portrays a senator, Anthony Ramos portrays Corporal Martinez, Elizabeth Ludlow portrays Griffin, and Jonathan Howard portrays Asher, while Randy Havens appears in an undisclosed role. Through motion capture, T.J. Storm reprises his role as Godzilla, while Jason Liles, Alan Maxson and Richard Dorton portray the heads of King Ghidorah. Liles also portrays Rodan via mo-cap. The film retcons the monsters designation from "MUTOs" to "Titans". For the monsters, Dougherty wanted their designs to emit a Godly presence and evoke a sense of worship, stating, "Primitive man saw these creatures, and you want to give them a presence that would make him drop to his knees and bow to this god…It can’t just look like big dinosaurs. Jurassic Park has that covered. These have to be distinct. They have to be their own thing. They’re Titans." In March 2019, the film was featured on the cover of Total Film which revealed exclusive photos and information. An extended preview was exclusively presented at WonderCon and CinemaCon. Warner Bros. attached the extended preview to IMAX screenings of Shazam!. 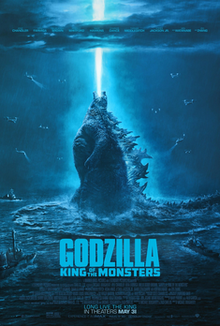 In April 2019, the main theatrical poster was released online. This page was last edited on 19 April 2019, at 06:47 (UTC).